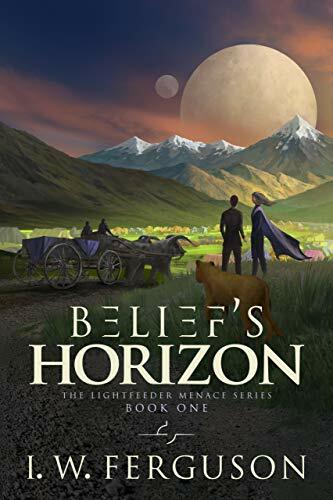 Belief's Horizon: Book One of the Lightfeeder Menace Series. Released Oct 22 2018. In KU (for now). Treachery at home. Otherwordly visitors. What else lies beyond belief’s horizon? Happen Fell lives on an isolated farm deep in the rainy woods on the magical planet Grith. It’s past time for him to go to the annual trade fair to begin his rites of passage, but one untimely trouble after another keeps him from exploring further than his home and the tiny school he attends with his cousin. And one person seems to lurk behind every trouble: Osgar. Once Happen finally leaves on his journey, he fears his father’s loyal employee will turn up any moment. But when a stranger claims that Grith could be facing a threat from beyond the stars, Happen's coming-of-age journey becomes much more treacherous—and mysterious. That looming threat is the Lightfeeder Menace, and it could destroy everything. Almost no one on Grith—Happen included—believes it could be real. But what they don't believe might kill them.